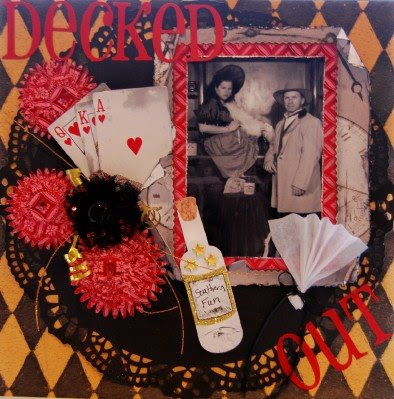 1. deck of cards- I used the Q, K, A of hearts in the lo in the pic I have three cards on my garter belt. 2. four poker chips-I used them as lifts for the flowers (really hard to see) they worked great and made the flowers stand out!!!! 4. one 5x5 sequined mesh-I cut into strips and then fan folded and put all five pieces together to make one poofy flower..very pretty. 5. 3 glittered grass stems-used to highlight the flower and card area. 6. one red acrylic pebble-used in the center of the poofy flower. 7. four shreds of gold gift bag filler- used as accents and curled to go with poofy flower. 8. one yard of black satin ribbon used to tie of pleated fan and add as an accent. 9. three red rhinestones -used in the center of the red flowers which are sooo pretty and blingy. 10. 3 gold star brads-used on bottle of Southern Fun since there is a bottle of Jack Daniels in the pic. 11. one 2.25x4 piece of self adhesive glitter paper-used for the label of the bottle of southern fun. the pic is of me and hubby in 1999 at one of those old timey photos. see close up of flowers in my gallery and how made.. thanks !